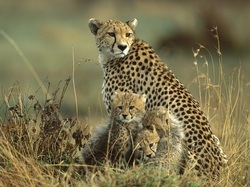 This is a cheetah, and like the lion, it is in the cat family. 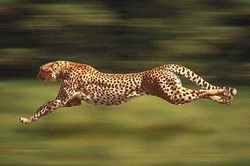 The cheetah has feet like a dog.They are the only cat that cannot climb trees! 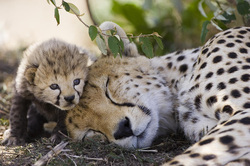 Cheetahs are meat eaters. They use their lightening speed to chase their food and use their sharp teeth to eat. 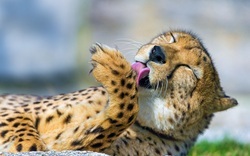 Cheetahs have a smooth covering. After a long day of hunting and playing, the cheetah is ready to sleep.